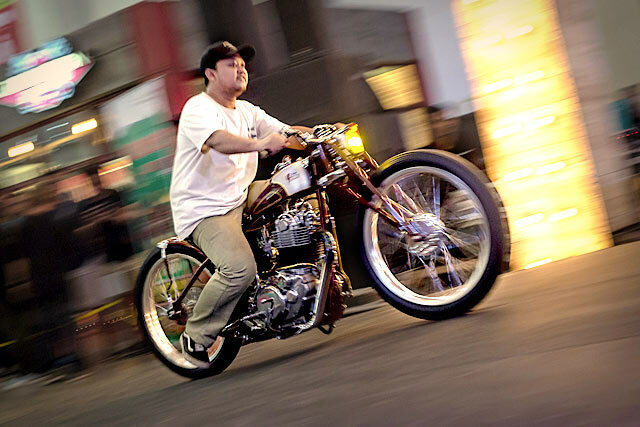 In our second big South-East Asian event for 2017, and easily one of the best shows all year, October saw us in Yogyakarta, Indonesia, for two days of custom motorcycle wet dreams, beers and sate sticks all wrapped up in a very cool hoedown called ‘Kustomfest’. We came, we saw, we wandered. And at the end of it, we were glad we did. Could you imagine the art world if its exhibits were held in strip mall parking lots? Imagine having to go to a swap meet or burger joint to see the latest from Cindy Sherman or David Hockney. It’d feel off, right? 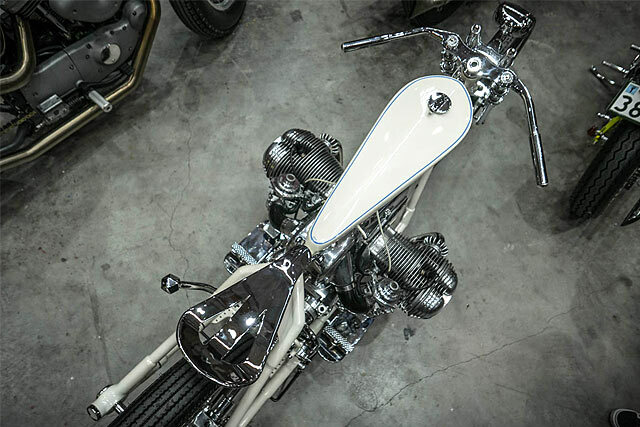 That’s how the motorcycle world treated two-wheeled works of art, at least until 2008 when custom bike builder Keino Sasaki, artist John Copeland and photographer Jeffrey Schad combined forces to create the Brooklyn Invitational: at its roots a motorcycle show, but much more culturally ambitious. We were lucky enough to be able to attend Malaysia’s 6th annual Art of Speed show in Kuala Lumpur last month. Rumour suggested that it was up their with the best Asian shows. After a long weekend full of local custom culture, food, beer, bona fide moto celebs and even a decent ride into the Malaysian countryside, we were just about ready to open a new Kuala Lumpur office. 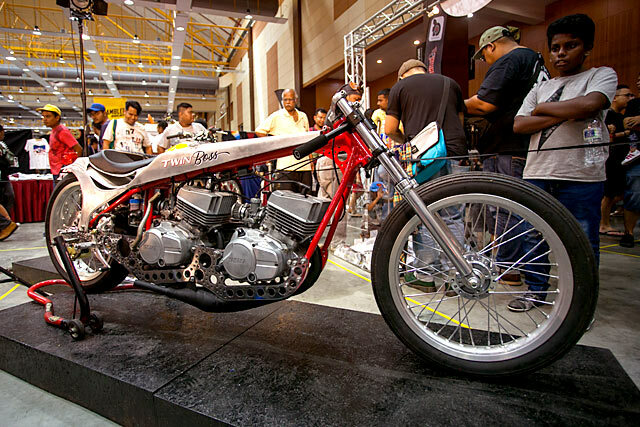 Claiming the title of ‘Best Bike Show in the World’ is no mean feat. With competition from the likes of The One show in Oregon and the AMD World Championships, to land a title like that would take some doing. And even though it’s just little old us giving out the gold, we’d probably forego the subzero conditions in Portland and give the billetesque AMD a miss. Where would we cast our vote you may or may not ask? Wheels & Waves, that’s where. With a sweet French summer on offer and more good food than your average Michelin-starred restaurant, we’d be in beautiful Biarritz. 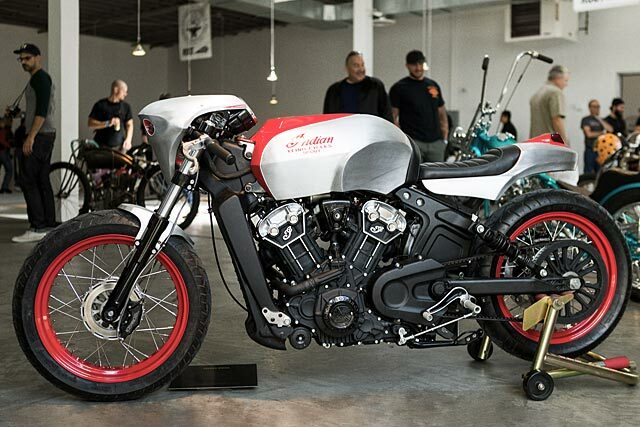 This year a barrage of biking celebs made an appearance, including the Boys from Blitz, the very dapper Paul d’Orleans and even America’s Roland Sands. Wish you were there? So do we. But fear not, because the boys from Southsiders Motorcycle Club attended for us – and they took a whole bunch of video cameras to record the bountiful biking shenanigans for posterity. Scott Halblieb is a good mate of Pipeburn. He’s also a rather excellent bike builder, who has blessed us numerous times with his superb creations. So when he approached us about putting our good name to a little bike show he and a mate were organising down Louisville way, we naturally said yes. Then we toasted the show with some fine Kentucky bourbon. Then we toasted it again. And again. Then things got blurry. So the hangovers have finally passed and all the custom bikes have all been ridden home or taken back on their trailers. But the talk is still going about what a great event Throttle Roll turned out to be. We are super proud of our friends Mark Hawwa and Jordon Kightly for taking a punt on such a large scale event – and it looks like it paid off. Not that they made much money out of it, because it was free. Yes, free! 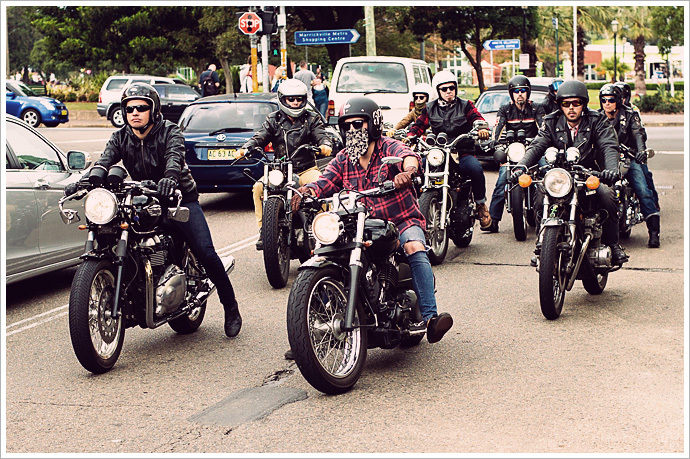 With over 3500 (motorcycle enthusiasts, families, hipsters and dogs) people attending the event across the day, the streets of Enmore were filled with the likes of Bobbers, Classics and Café Racers. Traffic clogged up as bikes where parked left right and centre. The ‘No Parking’ signs were covered so the footpaths were littered with stunning bikes – the way it should be. In the U.S. they have the 1 Moto show. France has its Wheels and Waves. And now we are very proud to introduce Sydney’s own world-class custom, classic, and café racer biker show – the inaugural Throttle Roll. It’s the brain child of our very own Mark Hawwa and Jordan Kightly. The same guys who brought us the Australian Café Racers and the now famous Distinguished Gentleman’s Ride. With a pedigree like that, we’re guessing it’s going to be a doosey. That’s why we put our name on it. 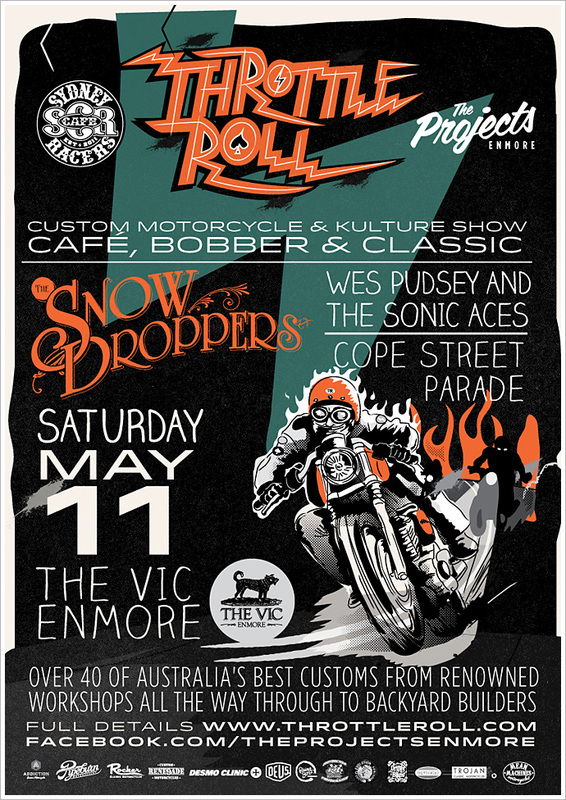 If you’re in Sydney next Saturday the 11th of May, you can drop by the The Vic in Enmore from 12pm onwards. There’ll be more than 40 custom bikes, live bands, a few cleansing ales and a whole bunch of guys and girls who like custom bikes… just like you. 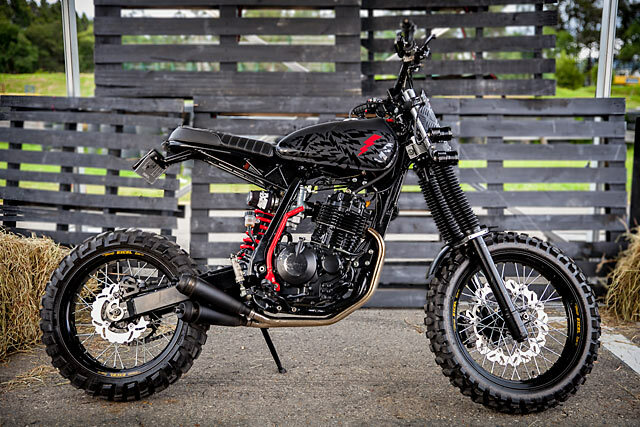 And if you’re the type who finds that too much fun is barely enough, then you can also join the Sydney Café Racers on a morning ride through the Royal National Park. Interested? Then check out more on the website and Facebook pages for the event. 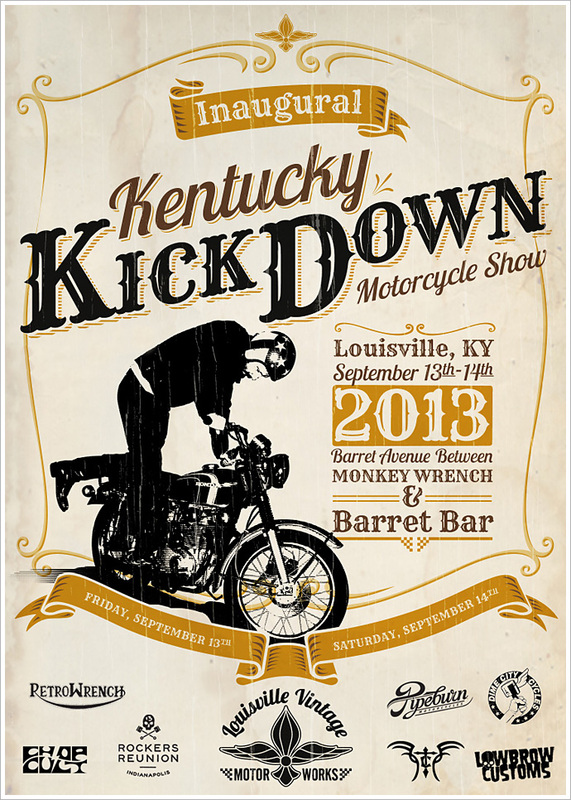 Scott and I will be there with bells on – and Pipeburn t-shirts as well. Feel free to come up and say hello.